Preheat oven to 350°. Shake flour in regular size (10x16) oven cooking bag. Place in 13x9x2-inch baking pan. Roll down top of bag. Add dill weed, seasoned salt, butter, lemon juice and water. Squeeze bag gently to blend ingredients. Add vegetables. Turn bag gently to coat vegetables with herb mixture. Arrange vegetables in an even layer. Sprinkle fish fillets with lemon pepper and seasoned salt. Starting at narrow end, roll up fish fillets; sprinkle with paprika. Place fish roll-ups in bag or top of vegetables. Unroll and close bag with nylon tie; make 6 half-inch slits in top. 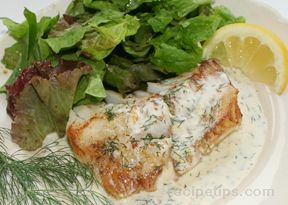 Cook 20-25 minutes or until fish flakes easily with a fork. Makes 4 servings.